I myself use to have the problem of wanting to get up in the morning, always wanting to catch a few extra z’s before heading off to school. This wasn’t always so, as in the military, you are required to wake up early for various reasons. However, waking up early can be beneficial in many ways. One way that waking up early can be beneficial to your work productivity. In 2010, Biologist Christoph Randler conducted a study which measured the productivity of a group of 367 students, he came to the conclusion that mornings people are more able to become productive. A few variable that come form this are that more sleep is able to be obtained, as well as having more time to complete work ( Morning People Are Productive people, Docuslide). Another benefit to being an early bird is the possibility of having better grades. 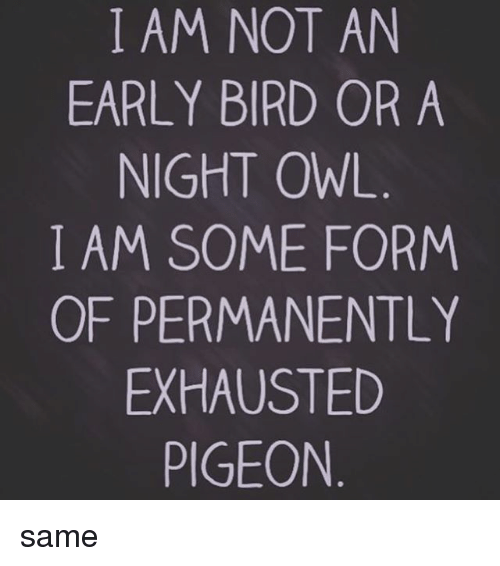 According to WebMD, a study that was carried out by Dr. Daniel Taylor at the University of North Texas, found that that people who were considered early birds had a higher gpa than those that were not early birds ( Early Birds Get Better Grades, WebMD). Again a few factors or variables can be seen here as well, such as the possibility that since there are fewer distractions in the morning than in the evening, a person can be more focused on what is required to get done. Overall , while the choice of waking early is a personal choice, I can say that it works for me because I have made it part of my routine. obviously when anyone tries to become a morning person, it will be difficult, but It is very much worth it once you are accustomed to it. This entry was posted in Uncategorized on October 21, 2016 by Nathan Andrew Morningstar. I consider myself a morning person. The main reason that I enjoy getting up early is for the satisfaction of productivity. I feel that the days I wake up later I get a significant amount of less work done. Although some days it is harder for me to wake up, I overall feel that I have a better day getting my day started earlier. Here is another article that describes a lot of benefits of waking up earlier. In high school, I definitely considered myself to be a morning person. In college, not so much. Being a morning person is relative to your environment. For example, being a morning person is hard when you live in a dorm and have to balance your academic responsibilities as well as work. Taking into account the active lifestyle of many college students and given that the average person needs around 9 hours of sleep, it’s hard to be a morning person during this age! However, there are some steps we can take, highlighted in this article (http://www.developgoodhabits.com/sleep-before-midnight/). What do you think are some things you recommend people do in order for them to get into the habit of becoming a morning person like you? 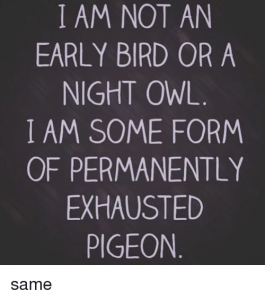 I think that you could improve your post a lot if you looked into the pros and cons of being a “night owl” as well as a morning person. I know a lot of people (including me) that works really well at night. You could also look into more scientific research into whetehr being a morning person is really beneficial or if it just depends on the person. This was a great blog post. I am completely a morning person and I do have to agree with the fact that I get everything I need to done. I do my school work in the morning, work out, eat breakfast ,run errands, and more. Although I love to sleep my body just doesn’t let me sleep late. If people are not morning persons or they have trouble getting up, a cup of coffee always does the trick! No matter how tired I am coffee always gives me a bursts of energy to start my day! A nutritious breakfast also helps! If you are not a morning person and need to get up early one morning, or want to, here are some tips on how to make the wake up less painful! I consider myself a morning person. The main reason is that I enjoy getting up early is for the reason of productivity. I feel that the days I wake up later I get a significant amount of less work done. Although some days it is harder for me to wake up, I overall feel that I have a better day getting my day started earlier. Here is another article that describes a lot of benefits of waking up earlier.